NOW SELLING and under construction. Come home to The Heights neighbourhood , one of the most desirable neighbourhoods in Burnaby BC. There are areas in a city where people merely live and then there are communities like The Heights Burnaby real estate district. Similar to fine wine, these neighbourhoods keep getting better over time, becoming even more treasured the longer one lives there. With a street frontage of the contemporary West Coast architecture, the design of Verdi Burnaby condos on The Heights has been influenced by three principles: Old-World Quality, Modern Convenience and Contemporary Style. The Verdi Burnaby condos for sale feature floor plans between one bedroom and den to 3 bedroom plus den layouts. They are also affordably priced from $499,900. The presentation centre for Verdi condos is located at 3908 Hastings Street Burnaby. Verdi on The Heights is brought to you by Aquila Developments, continuing the BOSA tradition. 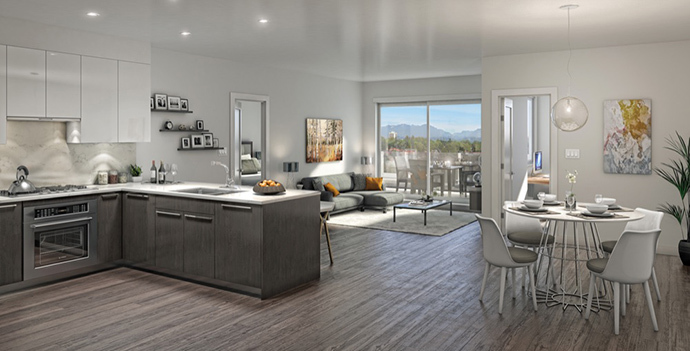 At Verdi Burnaby presale condos, you will find the perfect place for you to gather with friends, watch a sunset or look at the beautiful view of the mountains. Head to the Verdi rooftop terrace where you will find plenty of open space to entertain or just relax on the seating area. The terrace also features your very own vegetable garden plot and a gas BBQ area under a large wooden trellis. It’s the perfect place to grill some steaks paired with your home grown veggies and unwind with neighbours and friends! The architecture is by award winning Chris Dikeakos Architects. The building will feature a residential roof top patio and each home comes with the 2-5-10 Travelers Insurance Company of Canada home warranty package. The Verdi Burnaby condos come with 1 secured underground parking and 1 private storage locker. There is a rough in for a security system in each home and every residence has hard wired smoke detectors and fire sprinklers. For more details, please visit www.verdiliving.com or you can simply fill in the online form at the top of this page for all the information. The homes at Verdi Living are exceptionally finished and designed by renowned Cristina Oberti Interior Design with two contemporary colour palettes called Giomo (Light) and Notte (Dark). Burnaby Verdi on The Heights condos also feature wide plank laminate floors in the dining and living rooms as well as the kitchens plus carpet in the bedrooms. Each bedroom closet includes built in rod and shelving for great storage space in addition to laundry closet with a front loading washer and dryer. Homes at Verdi Burnaby condos also come with stylish roller shades, electric and efficient baseboard heating, generously sized outdoor terraces and balconies in addition to gourmet kitchens with beautiful laminate cabinets with soft close drawer mechanisms, breakfast bars in most floor plans, under mount stainless steel sink, Kohler pull out faucets, quartz counters and backsplashes in addition to under cabinetry lighting. Also, the kitchens include full size appliances with Bosch stainless steel cooktop, wall oven and dishwasher with integrated panel as well as a Fisher and Paykel convection wall oven and Broan slide out hood fan. The elegant bathrooms at The Burnaby Verdi on The Heights condos includes beautiful hand set porcelain tile, quartz counters and matching backsplashes, Hytec acrylic deep soaker tub, Kohler faucets and under mount sinks. Many of the ensuites will have double vanities as well. The bathrooms also come with Kohler dual flush toilets, polished chrome towel bars and large vanity mirrors. For your added convenience, the homes also come with central data media boxes for high speed internet, digital cable and communications. There are a couple of optional upgrades that includes engineered hardwood floors and a Danby 50 bottle capacity wine cooler with digital thermostat. There is an awesome range of floor plans in this boutique low-rise residence on The Heights. From the 2 bed/1 bath layout to the massive 3 bedroom plus den/2 bathroom layout, there’s definitely a floor plan for every homebuyer here. Here are a few examples of the draft layouts. Please note that they are subject to change at any time. From the Verdi Burnaby condo web site: NOW SELLING FROM $499,900! COME HOME TO “THE HEIGHTS” BURNABY’S MOST DESIRABLE NEIGHBOURHOOD. If it is true that there’s no place like home, then you are likely to proclaim “THERE’S NO PLACE LIKE VERDI” With a street frontage reminiscent of the contemporary West Coast look, the design of VERDI has been influenced by three principles: Old-World Quality. Modern Convenience. Contemporary Style. THERE ARE AREAS IN A CITY WHERE PEOPLE MERELY LIVE. THEN THERE ARE NEIGHBOURHOODS. LIKE THE HEIGHTS. SIMILAR TO FINE WINE THESE NEIGHBOURHOODS KEEP GETTING BETTER OVER TIME, BECOMING EVEN MORE TREASURED THE LONGER ONE LIVES THERE. 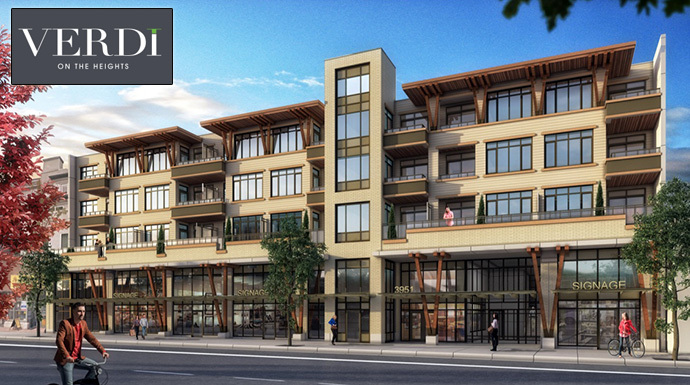 The Verdi Burnaby condo sales centre is now open at 3908 Hastings Street, Burnaby BC.